It took an extra day, but the MLB playoff brackets are set. From 30 teams, we are down to 10 that still have a chance to win the 2018 World Series. Before the postseason officially gets underway with Tuesday’s National League Wild Card Game, let’s take a look at each team’s odds to win a world championship in 2018. Naturally, the Red Sox remain the top favorites to win it all after setting a franchise record with wins. Chris Sale has returned from the DL and appears ready to lead the rotation, which is the lone question mark Boston faces heading into the playoffs. If Boston’s rotation can perform anywhere close to their best, the Red Sox will be tough to beat. Not surprisingly, the reigning World Series champions are tied with the Red Sox for the best odds. What is surprising is that Houston’s lineup doesn’t appear as scary as it did a season ago. However, the team’s pitching staff may be better. The rotation is outstanding and loaded with proven postseason pitchers. Also, the Astros won last year’s World Series in spite of their bullpen, which appears to have turned into a strength this season. Now that the Dodgers avoided the Wild Card Game, they appear to be in the driver’s seat in the National League. They obviously have the starting pitching with Clayton Kershaw, Rich Hill, and others that’s capable of carrying them back to the Fall Classic, as well as a deep lineup that can power their way to postseason wins too. The Dodgers have rarely put it all together this year, but all the pieces are there to win in October. The Indians remain an intriguing dark horse in the American League. They didn’t win nearly as many games during the regular season as the other teams in the A.L., but the slate gets wiped clean when the playoffs begin. The bullpen will have to hold up better than it did during the regular season, but with their rotation and several dynamic offensive players, they are a serious threat. 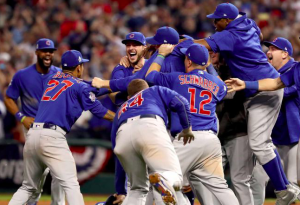 Despite having to settle for a wild-card spot, the oddsmakers still like the Cubs. They have the lineup and rotation needed to make a run, not to mention plenty of postseason experience. However, the bullpen is a question mark, so they could be a bit of a sucker’s bet at 8-1. It’s not hard to see the Yankees making a deep run again, assuming they survive the Wild Card Game. If the New York bullpen clicks, the Yankees can protect any lead they have after the 6th or 7th inning. Considering all the home run threats they have in their lineup, the Yankees will be a tough out. They also proved in late September that they can match up with the Red Sox head-to-head. Remember, they were considerable favorites at the start of the season, so they should not be overlooked. Oddsmakers still don’t believe in the Braves all that much. Admittedly, getting the Dodgers in the NLDS will be a tough matchup for them. However, Atlanta has a nice blend of power and speed in their lineup. However, it’s unclear if some of their young pitchers can deliver in the postseason against some proven aces on the other side. Don’t count them out, but the upstarts from Atlanta may not be ready to win in October just yet. Oakland doesn’t get nearly enough credit for their amazing regular season. However, they still face long odds in the playoffs, namely a Wild Card Game with the Yankees followed by a potential series with the Red Sox. Oakland can flat out hit, and their bullpen is one of the best in the game. However, the makeshift rotation they put together may not be built for postseason success. Milwaukee may be the best value pick of any team in the postseason. For starters, they are red-hot heading into the playoffs. They also have home-field advantage on the National League side of the bracket. Of course, the Brewers will be relying a lot on their bullpen and their offense to carry them. Whether their rotation can do enough against the Cubs or Dodgers in a long series remains a serious question. Colorado is an underdog in the Wild Card Game, so naturally, they face long odds to win the World Series. If they can get past the Cubs, their young pitchers could pose a problem for some of the other teams in the National League. The same can be said of their lineup. However, it’s hard to deny that the Rockies are the least likely of the 10 teams to win the World Series.